Pacific Dental has been in practice since 1971, continuously staying on the cusp of innovation in all things dentistry. Recently, it was time to apply this patient-centric philosophy to their digital presence as well, and we at MarketDental are pleased to have been chosen to create a new website to reflect the friendly, devoted approach Pacific Dental offers their happy patients. The new website features a clean, minimalist design with soothing shades of blue throughout to create well-anchored navigation in a fully responsive format across all devices. 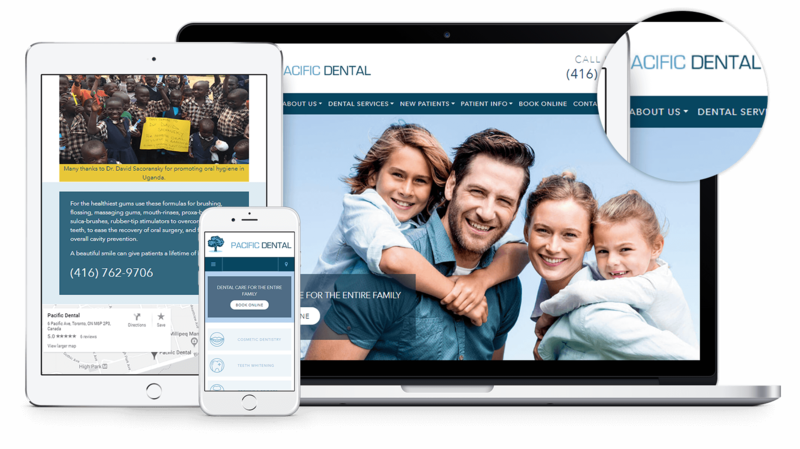 We included integrations such as a patient education feature, downloadable forms, virtual tour, gallery of cases, and an online appointment booking system - all of which add value to the new and existing patients of the practice and help Pacific Dental to offer added care in their online presence.